You're going to think you died- from boredom. What's up, everyone! Marissa here. Day 8 and I'm still alive, although I don't know how many more of these movies I can survive. Especially during the most wonderful time of the year, where good horror films are everywhere! I cannot believe how many craptastic movies horror movie Amazon will carry. Amazon Prime should be paying me. No, really, if I had some spare time I would go through and watch all of these movies, writing a dissertation about statistical probabilities and smart math-y stuff like that- kind of like the Caine-Hackman theory in PCU. Until I find that time I'll have to stick to reviewing a few more of these films in the hopes of finding something worth its weight in film stock. Bood Reunion was destiny's pick for me tonight. And, while I was more entertained tonight than I was during my last picks, this one gets filed under How the F*%k Does This Get Made? And, if you aspiring writers out there like me need a reason to feel worse about yourselves, there are also two sequels to this film, also available on Amazon Prime. You're Welcome. The plot actually starts out with a promising premise: a girl heads home to investigate her mother's death, only to find out her mother is a vampire. The problem is, the no-talent clowns who adapted this for the screen decided to cast the worst actors possible, film it on their mom's street, and use dollar store vampire's blood and teeth. No, that is too harsh. I should not insult dollar stores like that. The cast and crew are a who's who of who the heck cares, with Jim DeVault in the director's chair and whoever answered their Craig's List ads as the cast. The real star of this show was the guy who looked like Francis from Pee-Wee's big adventure. I would include his picture for you to compare and contrast, but he doesn't have one anywhere on the internet. My co-worker's cat has his own IMDB picture, but this guy couldn't get there. I enjoyed looking this actor because it helped me escape the pain of the crappy dialogue and complete lack of action for 95% of this film. Even the risque scenes were awkward to watch. Seriously, how do you mess that up? This film made me think Skin-a-Max and HBO late night directors don't get the credit they deserve. In the mood for a cheesy 80's laughs and some early Jim Carrey overacting? Check out Once Bitten. A classic that still holds up, The Lost Boys boasts some quality scares and Richard Gilmore all in one place. 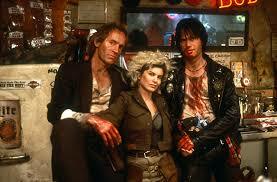 Near Dark is an awesome movie that many have missed. It's like a vampire western, with one of my all time favorite Bill Paxton roles!